Apart From Eggs, What Are Other Sources of Protein for Breakfast? Provolone is an excellent sandwich cheese. 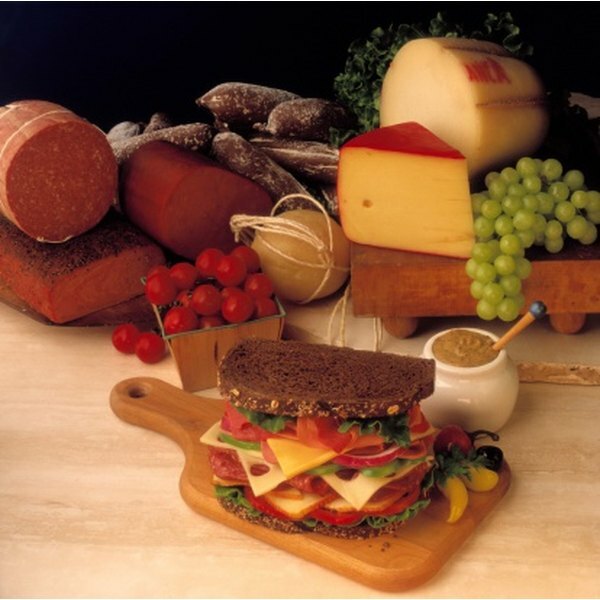 Provolone is a semi-hard Italian cheese made from buffalo or cow's milk that is sometimes smoked for added flavor. It comes in two varieties: dolce, a mild provolone aged for two to three months, and piccante, a stronger cheese aged for six to 12 months. A slice of provolone cheese weighing 1 oz. contains 98 calories. A 1 oz. serving of provolone has 7.45 g of fat, 7.16 g of protein and 0.6 g of carbohydrates, meaning that 68 percent of total calories come from fat, 29 percent come from protein and 3 percent come from carbohydrates. Just over 63 percent of the fat in provolone cheese is saturated fat. One slice of provolone cheese also contains 245 mg of sodium and 19 mg of cholesterol. A serving offers 17.6 percent of the recommended dietary allowance of calcium, 17 percent of the RDA vitamin B-12, 15.4 percent of the RDA of vitamin B-6, 7.3 percent of the RDA of vitamin A, 6.9 percent of the RDA of riboflavin, 6.6 percent of the RDA of phosphorus, 6 percent of the RDA of zinc and 5.9 percent of the RDA of selenium.